A team of European astronomers  have observed eight Brown Dwarfs, i.e., small and faint objects also known as "failed stars", with the TIMMI2 infrared sensitive instrument at the ESO 3.6-m telescope on La Silla. From two of these, mid-infrared radiation is detected - for the first time ever from such objects with a ground-based telescope . While the younger Brown Dwarf, aged a few million years, is found to be surrounded by a dusty disk, no warm dust is present around the older ones. The new observations support the following formation hypothesis for Brown Dwarfs: they are born in the same way as "real" stars, by contraction in interstellar clouds of gas and dust . During the later stages of this process, the infalling material is transferred onto the star via a gas and dust disk . This disk - in which planets may possibly form - then disperses with time. Astronomical objects known as "Brown Dwarfs" are "failed stars" . Their comparatively small mass, less than about 7% of that of our Sun (or about 75 times the mass of planet Jupiter), is too small to achieve sufficiently high pressure and temperature at their centre to ignite energy-producing nuclear processes. Some astronomers also refer to Brown Dwarfs as a "missing link" between planets and stars, being neither one nor the other, yet with similarities to both. They do not burn hydrogen to helium as "real" stars do, but continue to emit faint light as they slowly contract and cool during millions of years. They end their inglorious life with a whimper and finally fade into eternal insignificance. Although Brown Dwarfs were theoretically predicted already in 1963, astronomers had to wait until 1995 for the first one to be discovered. This was mainly due to their extreme faintness as compared to normal stars - even the most nearby Brown Dwarfs shine so faintly that they can only be observed with relatively large telescopes. As they are rather cool objects, they emit mostly in the infrared spectral region; hence they are best observed with astronomical instruments that operate at those wavelengths. With improved techniques, however, more and more Brown Dwarfs have been found and the count has now reached several hundred. Many of these are located in the well-known Orion Nebula. Others move through interstellar space, like the lonely KELU-1 first discovered in 1997 at the ESO La Silla Observatory by Chilean astronomers. With a distance of only 33 light-years from the Sun, it was one of the closest Brown Dwarfs known at that time. Astronomers are still doubtful about the way Brown Dwarfs form. Among the numerous suggestions are the star-like contraction from an interstellar cloud of gas and dust and also another based on "ejected stellar embryos" . This latter scenario says that very young stars that are still accreting material are "kicked out of the nest" by their more massive brothers in multiple stellar systems. In this dramatic process, the unlucky objects are stripped of their surrounding disks. This effectively halts their further growth by accretion and they end up as underweight Brown Dwarfs. Recent observations at ESO have shown that the Brown Dwarfs in the Orion Nebula most likely have formed as stars do, i.e. by contraction in a cloud of dust and gas. The clue to this was the observation of an excess of near-infrared radiation from many of these objects, interpreted as the presence of dusty disks around them. 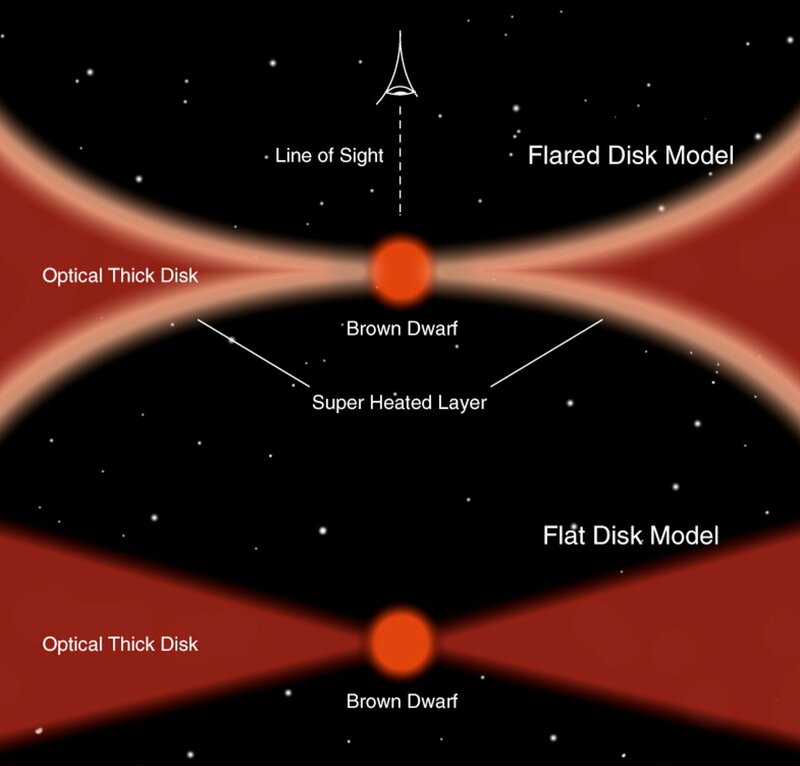 The astronomers then argued that if the young Brown Dwarfs possess such disks exactly like real stars do, then they must also form in the same way. Those observations were carried out in the near-infrared spectral region (in the 1.2 - 2.2 µm wavelength interval) with the ESO 3.5-m New Technology Telescope (NTT) . However, dusty disks around young stars (and presumably, those around Brown Dwarfs) radiate mostly at longer wavelengths. A detailed study of those disks is therefore best done with instruments that are sensitive to even longer wavelengths, e.g., in the mid-infrared to the sub-millimetre spectral region (10 - 1000 µm). This is in fact the only spectral interval where emission emanating from solid particles can be directly observed and their (mineral) composition thus be analysed. Pioneering observations in this wavelength interval of some Brown Dwarfs were made in mid-1995 by the ESA Infrared Space Observatory. However, the ISO instruments provided comparatively low image sharpness and these observations were hampered by confusion with the radiation from other objects in the same sky field. And the ISO mission was over before Brown Dwarf objects were discovered in larger numbers. Astronomers have therefore long wanted to observe Brown Dwarfs with large ground-based telescopes in the mid-infrared spectral region. But these objects are faint and few suitable instruments that work at these wavelengths are available at the world's large astronomical telescopes. Long exposures are necessary to record the faint emissions and until now, it had not been possible to perform such highly demanding observations of Brown Dwarfs. Now, however, the first ground-based detection of mid-infrared radiation from two Brown Dwarfs has been achieved by a team of European astronomers , using the Thermal Infrared Multimode Instrument (TIMMI2) on the ESO 3.6-m telescope at the La Silla Observatory (Chile). They pointed the telescope towards a total of eight Brown Dwarf objects and recorded the emission at three different mid-infrared wavelengths (5, 9.8 and 11.9 µm). "We were delighted", says team leader Daniel Apai, "to detect radiation from two of these with TIMMI2. These are the first observations of their kind with a ground-based instrument. And although we could only establish upper limits for the radiation from the five other objects, these results are highly significant for our attempts to understand the formation and evolution of Brown Dwarfs." One of the objects, known as Cha HA 2 and located in the southern constellation Chamaeleon , had earlier been observed with ISO. It is a bona-fide Brown Dwarf object and an image obtained with the Hubble Space Telescope indicates that it may possibly be double. It is a relatively young Brown Dwarf and is a member of the very young Cha I star-forming region - the age has been estimated at 2 - 4.5 million years. The ISO observations hinted at the presence of a dust disk around this object - this is fully confirmed by the new TIMMI2 observations. Moreover, the mid-IR radiation measured with this instrument interestingly shows the absence of a strong emission feature from silicates (at about 10 µm wavelength). 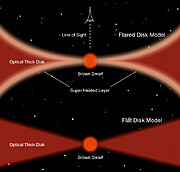 According to the astronomers, this indicates that the disk around Cha HA 2 is comparatively dense and flat, and without a heated outer layer, cf. ESO Press Photo eso0220 . The other Brown Dwarf from which TIMMI2 has now detected mid-infrared radiation is one of the closest of its type. Designated LP 944-20, it is located in the southern constellation Fornax (The Oven) at a distance of only ~15 light-years. It is much older than Cha HA 2, though, probably 500 - 650 million years. In this case, the age was determined by measuring the strengths of spectral lines of the element Lithium; the older the object, the less is the content of Lithium. The observations show that the radiation from LP 944-20 comes from the cool star itself - it does not possess a surrounding disk as does the much younger Cha HA 2 . Daniel Apai explains: "This all fits very nicely into the current picture of the evolution of Brown Dwarfs. They are born like stars by contraction in an interstellar cloud of gas and dust. At least some of them acquire a surrounding disk during this process. But that disk disperses after some time and we therefore only find it around relatively young Brown Dwarfs, not around older ones." Nobody knows yet whether planets form in those disks around young Brown Dwarfs (as this was the case in the disk around the young Sun and other stars), but it might happen. Only future observations with much more sensitive instruments will be able to cast more light on this intriguing question. ESO's Very Large Telescope (VLT) will soon be equipped with the VLT Mid Infrared Spectrometer/Imager (VISIR) , an extremely powerful mid-infrared sensitive instrument that is well suited for this kind of studies. Further into the future, the Atacama Large Millimeter Array (ALMA) will provide excellent opportunities for in-depth investigations of Brown Dwarfs. With unequalled sensitivity and very good image sharpness, ALMA will be able to image disks around the nearest Brown Dwarfs and possibly, to detect signs of (forming) planets in them. This press release is issued in coordination between ESO and the Max-Planck-Institut für Astronomie (Heidelberg, Germany). A German version is available at the MPIA website ( http://www.mpia.de/Public/Aktuelles/index_de.html ). The team consists of Daniel Apai , Ilaria Pascucci and Thomas Henning (all at Astrophysikalisches Institut und Universitätssternwarte, Jena, Germany, and Max-Planck-Institut für Astronomie, Heidelberg, Germany), Michael Sterzik (ESO-Chile), Randolf Klein and Dimitri Semenov (Astrophysikalisches Institut und Universitätssternwarte, Jena, Germany), Eike Günther and Bringfried Stecklum (Thüringer Landessternwarte Tautenburg, Germany). Cha HA 2 stands for "H-alpha emitting object no. 2 in the Chamaeleon I Dark Cloud". The photosphere of the young Brown Dwarf Cha HA 2 also emits mid-IR radiation. However, it is quite far away - about 500 light-years, or more than 30 times more distant than LP 944-20 - and that radiation is too weak to be detected with TIMMI2. The information presented in this Press Release is based on a Letter to the Editor in the research journal "Astrophysical Journal" ("Probing Dust around Brown Dwarfs: The Naked LP 944-20 and the Disk of Chamaeleon H-alpha 2" by D. Apai and co-authors (Vol. 573, pp. L115-L117; July 10, 2002). It is available on the web at http://arXiv.org/abs/astro-ph/0206210.